All the works on this evening’s Resolution program begin with cogent ideas that have strong emotional integrity. Michaela Cisarikova’s I Love Myself, Do You? examines the duality of identity and self-worth, Sara Green transforms her own experiences of major spinal surgery in Burnt Out and Dani Harris-Walters traces a journey in search of fatherhood in Happy Father’s Day. 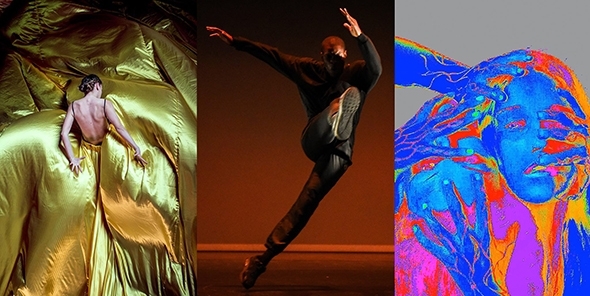 Both Cisarikova and Green use striking imagery at the start of their respective works while Harris-Walters uses his presence alone to reveal his biologically-inspired choreographic exploration. While each beginning holds promise, in a Darwinian sense Harris-Walters is the only one to keep that promise throughout, ensuring its survival somewhere in our choreographic imagination. What happens to a work that begins well but trails off in interest? Where does the interest go and why? Ideas in choreographic terms are argued primarily through the body and visual imagery, working with music as an emotional and rhythmic support. Each of this evening’s works places the body in a central role; Cisarikova suggests ‘the old Cherokee fable of two wolves fighting within you’ by the initial entangled embrace between herself and Jenn Vogtle; Green divides her persona into four performers each shaking off their oversized jackets as a metaphor of disintegration, while Harris-Walters takes us through his own body’s encounter with the process of procreation. It could be argued that Harris-Walters has an advantage by using text; without it the physical component would not add up to much of an argument, but it is the way he gleefully pairs text with gestures and unassuming hip hop sequences that engages the imagination of the audience. Borrowing from his own material, this process of engagement is like a mating ritual that depends on the maintenance of stimulus for its successful outcome. I Love Myself, Do You? opens on a billowing swathe of greenish gold parachute silk suspended diagonally from an upper corner covering much of the stage. In the middle of the silk is a hole through which Vogtle is supposed to rise in the dark on the shoulders of someone hidden underneath but a premature lighting cue finds her on her way up a little unsteadily and the magic is lost; it is on such small details that the fate of visual imagery depends. More importantly, for its overpowering spatial influence, the silk seems to have a relatively small impact on the work’s concept; Cisarikova joins Vogtle in the centre opening for a duet, seen from the waist up, that has a sculptural quality of both a physical and a psychological battle, but when the silk is later withdrawn its significance is called into question. Simeon Miller’s lighting makes clever use of silhouette projections inside the silk that present alternative identities, but when Anna Guzak slides out from under the silk, her role in the duality of good and evil seems superfluous. Ross Allchurch’s score accompanies the work but is not sufficiently anchored to keep it together. In Burnt Out Sara Green, with assistant choreographer Sara Kaspersen, sets out to translate experiences and memories of surgery through the filters of illustration (Simon Gardner) and music (Burnt Outby Jamie Jay and Carlos Posada of Low Island). The opening sequence, with costumes (and perhaps makeup) by Auriol Williamson and strong (unattributed) lighting, holds the space together in a tight theatrical form that has emotional clout, but as the four performers (Olly Bell, Steff D’Arcy, Orion Hart and Murielle Werthauer) disperse the space dissolves into a long improvised freeform section like a series of filmic takes all joined together and superimposed. Perhaps Gardner’s creative input may have helped us decode this section, but watching performers in various permutations trying to scale the back wall on the open stage has limited allure. Green has already worked with Low Island on their music videos but their relationship is quite different here, more complex and less well defined. The beginning of Happy Father’s Day is almost accidental, rather like the meeting of a sperm and an egg around which the work revolves. But Harris-Walters hooks us unerringly into his monologue with allusions and an imaginative acronym of Seven-Up while identifying himself not only with the gang leader, Tess Tyrone, but as the biological hero of the story. Once the penny has dropped, he is fully in charge of the stage, and whatever he does uncannily insinuates or illustrates his path. The image that remains is the final one, where after a caterpillar-like spiral trajectory towards the centre of the stage his head slides into the spotlight of conception. Mission accomplished.